WASHINGTON, Jan. 31 (Xinhua) -- The U.S. space agnecy NASA has been back in business after the country ended a record 35-day government shutdown, but it may take a little longer to return to normal operations. 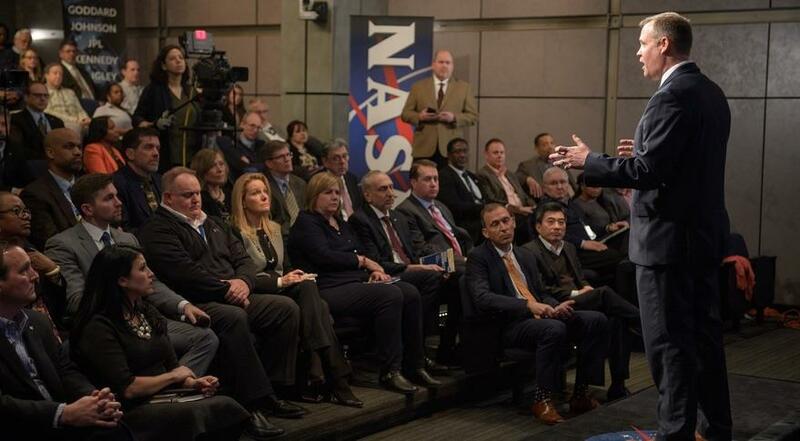 "We did everything we could to preserve as much of the agency as possible during the shutdown that we could legally do during this time," NASA Administrator Jim Bridenstine addressed employees during a town hall meeting on Tuesday at its headquarters in Washington D.C.
During the government shutdown, the main camera onboard the Hubble Space Telescope went out of operation due to a hardware problem, but its engineers are unlikely to fix the glitch until the end of the shutdown. NASA also announced the delay of SpaceX's first uncrewed launch of Dragon spacecraft. It was scheduled to take off in January, but now put off to no earlier than February. International scientific cooperation has been affected as well. An airborne observatory funded by NASA and Germany space agency was grounded. The observatory called SOFIA, installed on a Boeing airplane, is designed to take infrared pictures of our planet. "You can't just turn off and on the U.S. space program like a flashlight," the chief advocate and senior space policy adviser of The Planetary Society Casey Dreier said. "You have to warm it up and get it back into a coherent and functioning system that involves tens of thousands of people." Another effect of the shutdown is that the 35 websites across NASA that have been taken offline. Some have expired security certificates. The space agency is currently working to bring the websites back online. Bridenstine said that it might take longer than 35 days for NASA to recover. The selection of the next planetary missions as part of the New Frontiers and Discovery programs might be delayed, and the flight tests for the NASA Commercial Crew Program have also been moved to a later date. Besides, the memorial of NASA's annual Day of Remembrance was scheduled for Thursday, but has been postponed to Feb. 7, Bridenstine announced. The Day of Remembrance honors the 17 NASA astronauts who died in the agency's three tragedies: the Apollo 1 fire in 1967, the loss of the space shuttle Challenger in 1986 and the destruction of the shuttle Columbia in 2003. For NASA workers, employees are expected to start getting paychecks Wednesday and Thursday, but contractors aren't guaranteed pay for the time they missed during the shutdown.